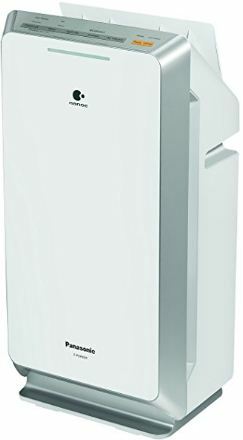 The Panasonic F-PXH55MWU Air Purifier is a good option if you seek a top-range air purifier. It can be purchased in under INR 22,800 (Check Current Price) from e-commerce websites. 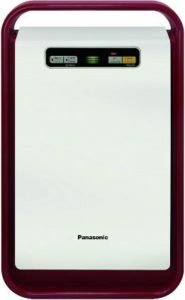 The Panasonic F-PXH55MWU is replete with features and except for the humidifier action almost all are present. 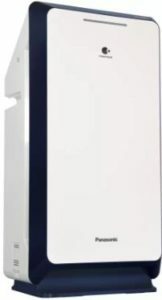 Another very good purifier but from Philips you can consider with nearly the same effectiveness in the Philips 4081. 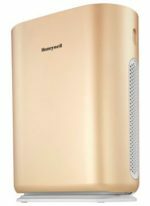 The looks of Panasonic F-PXH55MWU are genuinely attractive and similar to Panasonic F-PXF35MKU(D) air purifier. Light colors with a sense of dark outlining lends good appeal to the purifier. The material of the body is ABS plastic which is tough and scratch resistant and has a shiny surface. The dimensions of this model are such that the hump at the back is not protruding. It helps to cut short the space it needs on the floor. In summary it is a convenient choice for home and office spaces. Panasonic’s Nanoe technology makes use of a great innovative technique to inhibit harmful bacteria and virus. Be it the deadly swine flu virus H1N1, bird flu virus H5N1 or the Influenza virus, Panasonic’s Nanoe is answer to all of them. 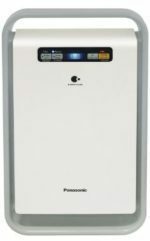 Panasonic F-PXH55MWU Air Purifier uses it too. In what may well be a news for you, Nanoe helps in the retention of moisture of the skin. Nanoe attach themselves in the skin pores and form a membrane which prevents moisture loss. This improves the keratin texture and your skin feels refreshed and hydrated. The purifier generates over 480 billion/sec Nanoe particles. Nanoe(5-20 nm) is wrapped in water molecule with OH radicals, which are capable of inhibiting bacteria and viruses by removing water from bacteria cell. The microbes are deprived of their water and are left shriveled and hence safely dealt with. Since the Nanoe device generates Nanoe particles only through the ambient moisture in the air, it never runs out of supply of raw material( moisture). Nanoe can also penetrate into fabrics like curtains and bed-sheets. As a result, it can decimate the spores of molds and bacteria/viruses from your fabrics too. 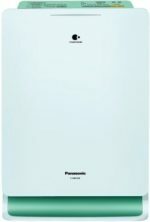 The Panasonic ECONAVI technology which stands for Ecology Navigation is a great feature of the Panasonic F-PXH55MWU Air Purifier. It works by regulating the flow of air by sensing the presence and location of humans and their activity patterns. It also adjusts its working based on a historical data which it maintains. For example the usual time when food is being cooked in the kitchen, it would increase its fan speeds and operate in Turbo mode. It also helps in bringing down electricity costs and greatly increases the effectiveness. 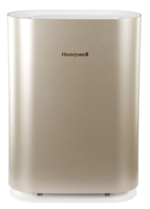 The Panasonic F-PXH55MWU Air Purifier is designed for bigger areas to the tune of 452 sq.ft. This makes it ideal for placing it in your drawing rooms or office reception area. The purifier filters have a life expectancy of 10 years as published in manuals which is grossly unrealistic. The manufactures seem agnostic of how terribly bad the pollution levels can get in this region. Nevertheless, its an indicator that the filters would last longer than other models which quote 2-3 years life. The complete set of filter replacement would cost around INR 7,000. Pollutants inside a room are densely concentrated till the height of about 1 foot above the ground surface. 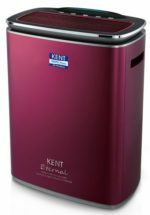 It is essential for an air purifier to effectively clean the low lying region like the floor. Different pollutants appear at different heights within a room’s floor and ceiling. Larger particles of dust and other things float or lie near the floor level. A little over 30cm, finer dust particles hover around in the air. 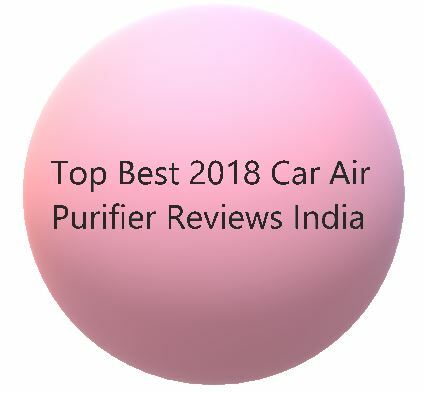 Still higher there are higher concentrations of odors and smoke etc. 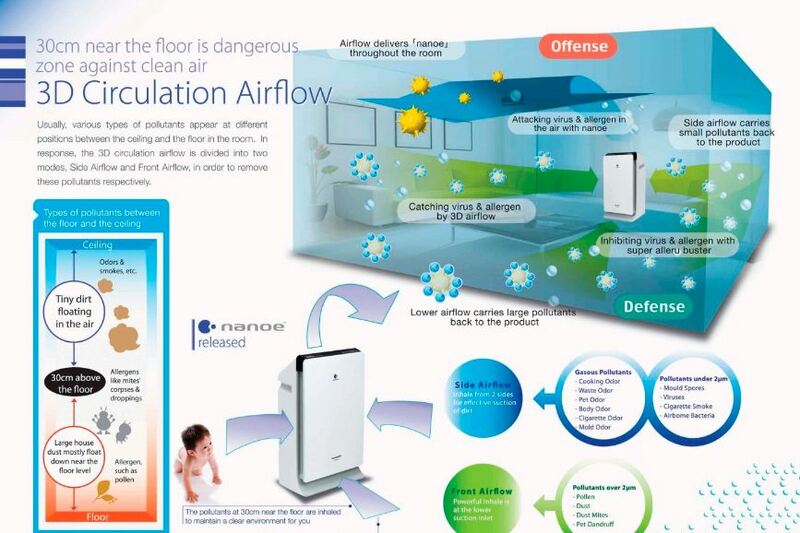 The 3D airflow feature of Panasonic F-PXH55MWU makes it possible to clean the room’s air with Side and Front airflow. There are four levels of fan speed. High, Medium, Low and Auto modes. As evident from the names these control the fan speed and thus the suction power of the air purifier. In auto mode, the air purifier adjusts the fan speed as per the need of the hour.